Castagnole - traditional doughnuts for Carnevale. Castagnole, Zeppole, Tortelli Milanesi, are some of the names given to the traditional sweets for Carnevale. 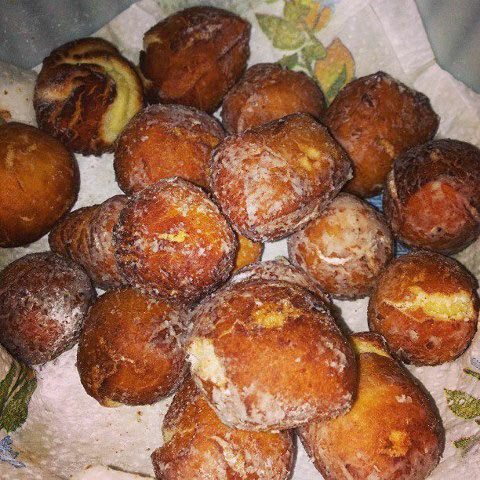 The castagnole are deep-fried doughnuts about the size of a chestnut (hence the name) and filled with patisserie cream. Yum!! Never mind the calories. They are sold in all the pasticcerias from the Epiphany until Ash Wednesday. Originating in Emilio-Romagna, the castagnole are prepared and enjoyed in many Italian regions even though the name may be different and the ingredients varied a little. We made pigs of ourselves at our neighbours' this week as their daughter had made some castagnole which were very hard to resist!